If you’re looking for a log cabin you have probably noticed that there are many different models on the market! Cabins normally come in the following thicknesses: 28mm; 34mm and 44mm. 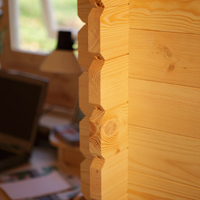 Ventina Premium Log Cabins are manufactured from kiln dried Nordic spruce, harvested from sustainable sources too ensuring sound environmental practices. We always advise opting for the thickest timber your budget will allow. Some cabins may look like good value for the size, but you should always check the timber thickness, which is displayed on our listings of Ventina Premium Log Cabins. All buildings of 45mm timber thickness and above are supplied with double glazed windows and doors, with the window being “tilt & turn” casement window not the “top” hung glorified summer house windows that are supplied with many cheaper alternatives. Each listing will clearly indicate what log thickness the product is offering and glazing specification. All Ventina Premium Log Cabins are supplied with heavy grade mineral roof felt as standard not cheap shed felt. You have the option to upgrade to a roof shingle. Felt Roof shingles offer a longer life to regular roof felt as they are smaller and therefore free to expand and contract more freely avoiding cracking. Cabins come with either Perspex glazing (sometimes called Plexiglas or styrene), toughened glass single glazing or sometimes double glazing. With Ventina Premium Log Cabins 28/35mm timber thickness cabins are supplied with single glazed windows and doors with the windows being “tilt & turn” timber casement units. The window and door frames are also manufactured using laminated /engineered timber for increased stability and strength. All Ventina Premium Log Cabins come with tongue and groove floor and roof boards without exception (except the garages where a floor may not be appropriate - optional). Be aware that some competitors offer cheaper cabins which are supplied with sheet materials for floor and roofs to save cost. Floors are supported on pressure treated floor bearers enabling you to place you cabin on a flat area such as paving. 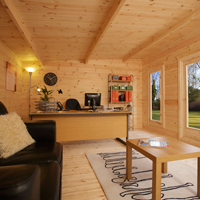 It is normal for cabins to be supplied untreated and it is for the customer to apply their own finish. Some people ask “why is this the case?” The reason is simple – the interlocking design of log cabins does not allow for the industrial process of pressure treatment to take place due to the swelling of the interlocking joints. However this is not a problem, because cabins are constructed from kiln dried Nordic spruce timber which accepts any treatment evenly unlike redwood pine – even the 28mm thickness is considerably thicker than that used for other traditional garden buildings such as cheap sheds and summer houses. We recommend the application of Sikkens or Sadolin range of wood treatment. It is not the cheapest but they are regarded as the best on the market, penetrates the timber as opposed to sitting on the surface, and will last many years. Both brands is available from all good hardware and DIY stores.